Eugene James Petralli was born September 25, 1959 in Sacramento, California. He is the son of former minor league player; Gene Petralli. hey released him & he signed with the Texas Rangers as a free agent. He played a s a back up catcher to Don Slaught as well as seeing some time at third base & DH. In 1987 he was the teams main backstop getting into 101 games, batting .302 with 7 HRs 11 doubles & 31RBIs. In 1987 he set a record with 35 passed balls on the season, while catching behind the plate. He broke former Met J.C. Martin’s record of 33 set with the White Sox in 1965. Martin’s passed balls were due, in part, to catching knuckleball pitchers Hoyt Wilhelm and Eddie Fisher. 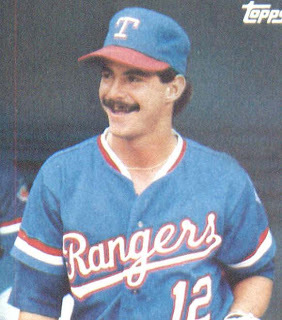 Petralli had one nightmare of a game where he had six passed balls in one game a few weeks after setting a record with four passed balls in a single inning. His biggest problem of that day & the season was that he was the personal catcher for knuckleball pitcher Charlie Hough. He would lead the league in passed balls three times (1987, 1988 & 1990). In 1988 he hit .282 with 7 HRs & 36 RBIs in 136 games played. He was the Rangers Player of the Month in August batting .342 in 25 games. After missing a lot of action in 1989 he returned to having his last full time season in 1990, before 19 year old Ivan Pudge Rodriguez took over catching duties. One of his biggest highlights was catching Nolan Ryans 300th victory during the 1990 season. Petralli remained with Texas until 1993 when he retired after 12 seasons, batting a career .267 with 24 HRs 83 doubles & 192 RBIs. 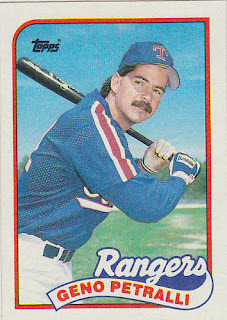 His last game was a near sell out since it was the next to last game played at Arlington Stadium before the Rangers moved into the new Ballpark at Arlington in 1994. He has two sons one, James is the singer & guitar player in the Texas rock band White Denim. The other son Ben, is also a switch hitting catcher like dad, playing in the Detroit Tigers organization.